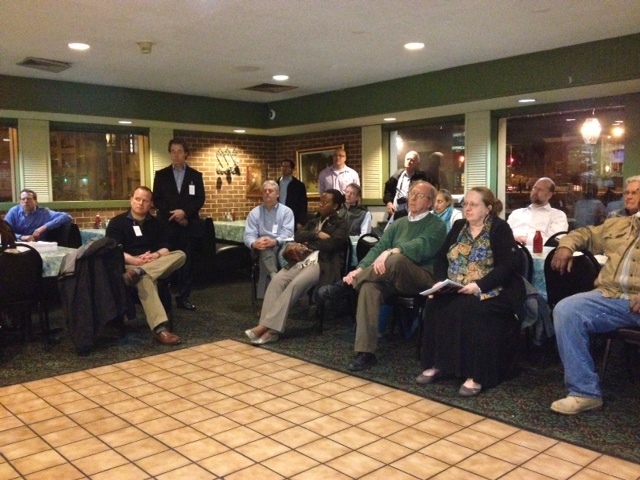 Attendees listen to a presentation about plans for a residential building at 1550 Penn Ave SE. I led off with a discussion of the ANC’s role on the project. NOVO Development is requesting two variances and one special exception from the Board of Zoning Adjustment (BZA). The BZA hearing is on April 30, and ANC 6B will consider the case during the commission’s April 2 planning & zoning committee meeting and April 9 full commission meeting. While ANC 6B can vote to support or oppose the variance and/or special exception requests, the BZA ultimately determines whether the relief is granted. Greg Selfridge of NOVO Development, architect Eric Colbert and transportation consultant Bill Schultheiss gave a presentation (pdf) on the project. Selfridge said the building would have 80-84 apartment units, with 75 percent of the units one bedroom. Colbert discussed the building’s design and noted the building’s 15 foot setback from the adjacent rowhouses on Kentucky Avenue. Schultheiss, a former Capitol Hill ANC commissioner, talked about traffic flow around the site, particularly the need to think about how vehicles will enter and exit the building. On parking, the building will include 31 spaces – 23 in an underground garage and 8 off of Freedom Way. Selfridge cited the property’s unique shape, shallow water table and proximity to transit as justification for the parking variance request. NOVO is also seeking a loading variance. Selfridge said the 55 foot truck loading dock requirement is unnecessary at the site, and that 55 foot trucks would have a difficult time navigating Freedom Way. My sense was attendees supported the loading variance request. The special exception request relates to the height of the building’s mechanical penthouse. Colbert said that the design was still in flux and the developer may not need the special exception request. On parking, attendees raised a number of concerns. Many residents are worried that residents from the building would take up on-street parking spaces along the 700 & 800 blocks of Kentucky Avenue SE. Selfridge and Schultheiss were confident that many residents in the building would not own cars and would instead use Metro, bikeshare and/or carshare services. A number of attendees asked NOVO to consider using existing curb cuts on Kentucky Avenue for the entrance to the parking garage, particularly since Freedom Way is extremely narrow. Selfridge said that they would explore the possibility of using the curb cuts with the District Department of Transportation but noted that DDOT prefers parking garage entrances off alleys. One resident noted that DDOT signed off on Douglas Development’s use of an existing curb cut for the proposed retail building at 1442 Penn Ave SE. Attendees also voiced concerns about the number of units and the target demographic of the building: young professionals. A number asked if NOVO would consider reducing the number of units or combining units to attract more families to the building. Selfridge said that NOVO was comfortable at 80-84 units and noted that there is a high demand for apartments on Capitol Hill. He also signaled a willingness to work with neighbors on a memorandum of understanding on noise, trash, construction and other issues. Traffic flow around the building is a major concern. Currently, vehicles trying to access the parking garage from the north would have to travel east on Potomac Ave SE, south on 17th St. SE, west on Barney Circle and north on Kentucky Avenue SE or would have to travel south down the extremely narrow Freedom Way. When the idea of making Kentucky Avenue a two-way street was brought up, a number of attendees voiced opposition. However, attendees also voiced concern about increased traffic on Freedom Way. One attendee suggested narrowing Kentucky Avenue to one-lane by adding diagonal on-street parking. While this would reduce speeding along the corridor and add on-street parking spaces, it would not resolve the issue of increased traffic on Freedom Way. I plan to ask DDOT about the diagonal parking alternative. Residents along the 1500 block of Pennsylvania Avenue SE raised concerns about pedestrian traffic from the building passing in front of their homes. Currently, the city allows residents to park their cars on driveways in front of their units despite the fact that the cars block the sidewalk. One potential solution would be to remove the curb cuts and add on-street parking along the 1500 block of Penn, though that would mean residents lose their current driveway parking. There was some discussion of the benefits of the project. It certainly would increase foot traffic on the 1500 and 1400 blocks of Penn Ave, which would help existing and planned retail along the corridor. Attendees also noted that the increased foot traffic would also improve public safety. Overall, I was pleased with the turnout and thought the meeting was helpful. I plan to work with the neighbors and the developer to address as many of the concerns raised as possible prior to ANC 6B consideration. Thanks to everyone who attended the two-hour meeting, and thanks to Greg Selfridge, Eric Colbert and Bill Schultheiss for spending time walking through the project and answering questions. And a BIG thank you to New York Pizza for hosting the meeting. Please post your comments, questions or anything I missed below. This entry was posted on Sunday, March 3rd, 2013 at 6:13 pm and is filed under Barney Circle, Development, Penn East. You can follow any responses to this entry through the RSS 2.0 feed. You can leave a response, or trackback from your own site. This is an exciting project that will increase residents and the desirability of this area There is a huge demand for rental apartments in Capitol Hill near transit. Many apartment renters do not have nor want vehicles. Glad all the bike parking will be included. The rents will be market rate – $1,200-$1,500/month with only ten percent affordable to households at 80% and 50% area median income. It would be nice if more units were affordable, especially to households below 30% AMI. The city desperately needs affordable apartments near transit. Dedicating two spaces for Zipcar will service the residents and the community. The developers failed to demonstrate why the community should support the parking variance. Parking is a resource and the laws are there to help us protect that asset. There will be other building projects and parking will naturally become more and more scarce as the area develops, lets not give this asset away early on just because they asked for it.